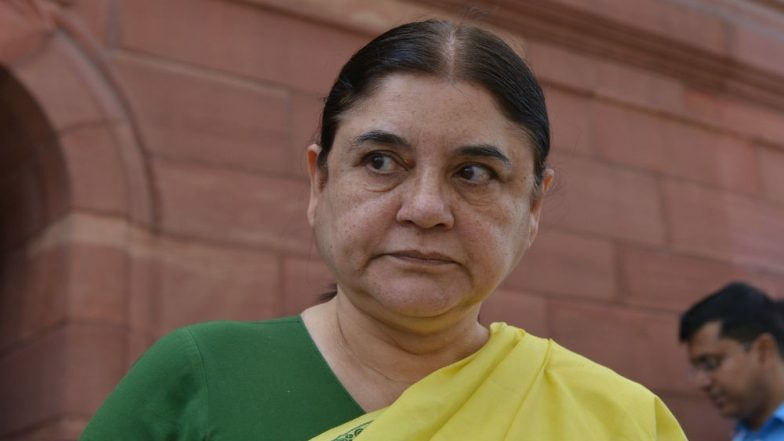 New Delhi, April 12: Union Women and Child Development Minister and Bharatiya Janata Party (BJP) leader Maneka Gandhi on Friday sparked a controversy saying that she won't work for the Muslims in Uttar Pradesh's Sultanpur if they don't vote for her in the upcoming polls. In a three-minute video of her speech in Sultanpur's Turabkhani area went viral on social media, Gandhi is heard saying that they should vote for her or else she may not be inclined to their requests. "I have already won this election, now it is for you to decide", she said. Uttar Pradesh Lok Sabha Elections 2019 Schedule: Constituency Wise Dates Of Voting And Results For UP General Elections. During her speech, Gandhi said that he is winning because of the love and support of people and that if her victory is without Muslims, she won't feel that good. "I am winning. I am winning because of the love and support of people. But if my victory is without Muslims, I won't feel that good", she said. "Then when a Muslim comes to me for work, I think let it be, how does it matter. It's all give and take, isn't it? ", Gandhi added. The BJP leader asked those gathered to spread the word about voting for her. Lok Sabha Elections 2019 Schedule: Voting In 7 Phases From April 11 to May 19, Counting And Results On May 23; Check All Dates For General Elections. Gandhi is fighting from the Sultanpur constituency, a seat represented by her son, Varun Gandhi, who will contest from Pilibhit in the Lok Sabha elections. The BJP, on March 26, had announced that Maneka Gandhi and Varun Gandhi would swap constituencies.